a Crazy Quilt block for Easter! 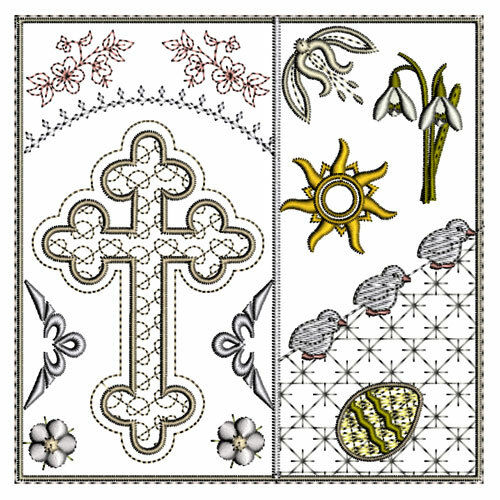 Easter has caught up with me and so today I tested out the Crazy quilt block I had designed to capture all the wonder of this lovely time of year. There are two crosses, one very simple and a more elaborate cross with some Celtic strippling. I have added white lilies, a beautiful hint of blossom and a glowing sun to remind us of the glory of Easter morning. Although the snowdrops are over this Easter I couldn’t resist adding them as they blended well with the gold and green colour scheme. Two eggs sit in the top left corner and some little chicks are scurrying across the bottom of the quilt. A stately daffodil draws the eye in the lower right corner and I have added an arch over the main cross where the lilies hang. There is a narrow vertical band which divides the block with little flowers that are based on my prunus bush (Chinese plum) which is currently alive with blossoms in my garden. This is a more simple block than some of my previous ones as I don’t want to crowd these important elements of Easter. I have mentioned before how important it is not to introduce too many colours into embroidery. For this block I selected a pale gold silk base, two shades of green, an ivory and a beige silk. As you can see I got distracted and stitched my lilies in green instead of white. 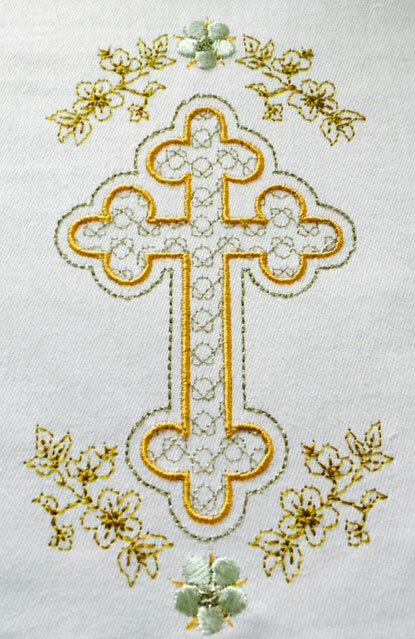 The plain cross on the right needs a gold thread so it stands out more. The only “alien” colour I have introduced as a contrast is a dark ecru (Sulky Rayon 1149) for the open blossoms and the grid work on the vertical band. Next time I will embroider the scrolls on the left in a deeper gold as the yellow is too pale. This photograph doesn’t show it very well, but some of my choices of greens were too blue and didn’t blend very well. These mistakes will be rectified in the final designs colour scheme but you may adapt that for your block and the fabrics you use. There are two edges that are “open” requiring close and careful trimming, on the arch and on the right side of the vertical band. When stitching the green fabric on the arch I failed to do that with a green thread but I have made a note on the instructions. The stitches that secure the band on the right have been widened and I have also taken out some of the delicate details on the snowdrops. Overall I am pleased with this block and cannot wait to give it the “crazy” treatment. I have prepared a smaller 5″ square block for those who do not have 8″ wide hoops. 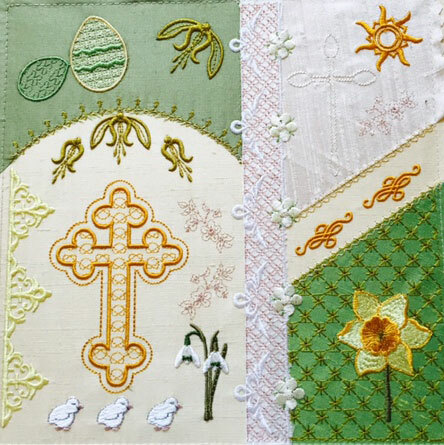 As an Easter bonus I have edited out the Celtic cross with some flowers so you can quickly run up some Easter cards or stitch it on napkins. Three of these designs fit nicely into my 360mm x 200mm hoop so I get 3 cards done in one go. I slowed my machine down for the Sulky metallic thread for the cross strippling and flowers centres, and was delighted with the results. My Diamond royale had no problem doing this with the same top stitching needle I had used for the whole of my embroidery and suffered no breaks. These embroideries just need to be pressed on the back and inserted into a card with an oval window, using a little light wadding backing for bulk all secured with double sided tape. These designs will be released at Graceful Embroidery on 2nd April, 2015. If you are a member of my Embroidery group they are available to pre order or you join now so you get the chance to preview and pre order all my new designs. 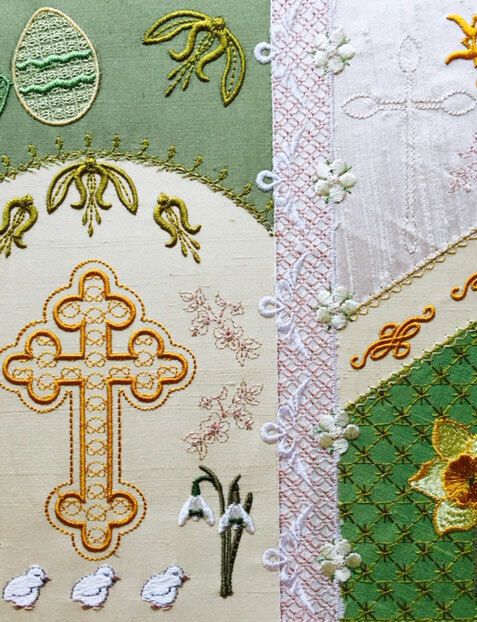 This entry was posted in Discussing machine embroidery, Inspirational, New Designs and tagged Crazy quilting, Easter, Making embroidered cards, The importance of colour. Bookmark the permalink. 1 Response to a Crazy Quilt block for Easter! Good morning, I was wondering if there is another way to join your group without having a yahoo address?